Kiwi-coin.com Review 2019 – Scam or Not? The popularity of Bitcoin cannot be denied. 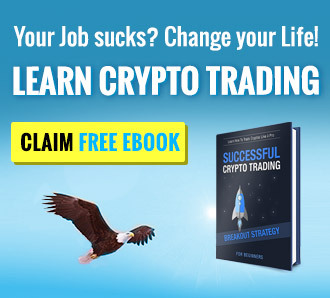 There are a lot of people today rushing into straight exchange website to get their hands wet in this cryptocurrency hype, and they’ve got the right reasons behind it too. Cryptocurrency is the new way of paying for goods and services online. Will this hype die down over the years? Or will it completely replace our traditional Fiat transactions? Only time will tell. Today, we will be looking into one of the first cryptocurrency exchange websites of New Zealand called Kiwi-Coin.com. One of the issues that customers find hard to get through would be the region-locked services that these websites offer. There are a lot of exchange websites today, but only a handful (legit) websites accept customers from around the world. We will try to create an account with them, look into their features, test their trade platform if they have one, and generally know the services they offer. Without further delay, let’s talk about that! Before moving forward, let us take a step back and know a little bit of Kiwi-coin.com. The website is 100% NZ owned and operated and was launched in 2014. The exchange is also registered Financial Service Provider in New Zealand. As of this moment, the website only accepts NZD deposits and withdrawals from and to New Zealand bank accounts. To create an account with the exchange, we just simply need to head on to their website and click register which is located on the home-page. Creating an account with Kiwi-coin.com means that you are willing to provide answers to the general questions like account level, active email, and mobile phone number. Aside from that, they’ve got the Identity tab wherein customers wanting to create an account need to provide their complete name, gender, date of birth, and identity level. They also got the “Address” and “Source of Funds” tabs wherein sensitive information is needed. 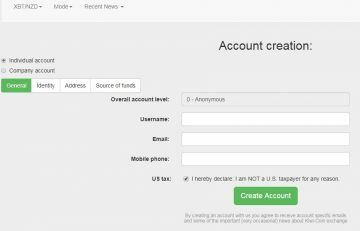 We strongly advise not to create an account if you are into websites that are completely anonymous. The website is not anonymous and creating an account with them means providing the required information. Please be advised that in order to create an account, the user only needs to fill up one tab and click on “register” after providing the needed information. Since we like to keep our registration anonymous, we only provided an active email account and went on to the registration. Here at Kiwi-coin.com, registered users are able to use their main trading platform or their test mode. This is an awesome feature since not all exchange websites have this installed into their coding. Most websites that offer a test account are trading websites. As mentioned, there are two types of accounts that can be made; one would be for the main exchange platform and the other for the test account. To Buy Bitcoins, just head on to your account page and click the “Buy” button located on the left-hand side panel. It’s really easy to use their exchange platform! Just type in how much BTC (XBT) you need and the platform will automatically calculate how much you need to pay for the BTC in NZD. Once the required information is typed in, just click on “Buy Now!” and you’re good to go! Selling is practically the same and instead of providing the amount of BTC you want to buy, you just need to input how much you are going to sell from your Kiwi-coin.com account. When it comes to fees, Kiwi-coin.com is at the mid-range compared to some of the exchange websites today. Here they charge you 0.8% for the taker fees, and 0.4% for the maker fees. Compared to other exchanges, they have a mid-range exchange fee. To deposit/withdraw NZD, the user needs to go through a verification process that includes their mobile phone number, NZ Address, and source of funds to name a few. Without further verification, users are only able to deposit and withdraw BTC into their accounts. In our case, since we do not have a New Zealand address, we are forced to review the website on the sidelines. This was pretty much expected from the start since they only cater to NZ customers. Moving forward, deposits and withdrawals can be made through the panel located on the left-hand side of the account page. Unverified accounts will have a message saying “Sorry, you are not allowed to do NZ dollars deposit. Please, go to Account->Profile to find out why.” once the NZ dollars tab is clicked. Apparently, the website only accepts NZD deposits from New Zealand banks and does not accept payments directly from Credit Cards. This can be both easy and inconvenient at the same time due to not having CC payment options. Due to the region-locked feature of the website, customers outside the country are unable to verify accounts since an NZ phone number and address is needed for confirmation. We found this frustrating since we were unable to see the available banks that they accept for NZD deposits. We were impressed however that they are offering a test account here at Kiwi-coin.com. If you are not familiar with exchange websites, there are only a handful of them offering this feature. Something that registered account holders should take advantage of! One thing that we need to stress out is that they have a very friendly website since our unverified account was still able to look into their exchange platform. We would like to note that not all region-locked exchange websites have this, we’re lucky to have been able to provide you guys with a sneak peek of what their platform looks like. All-in-all, the website looks great and they have reasonable exchange fees. For our readers that have a working account with them (NZ registered user) please do share your thoughts on the website in the comments section below.